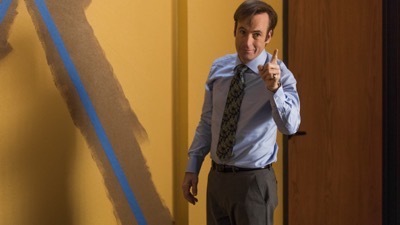 Ah, Vince Gilligan and building tension go together like chocolate and peanut butter but he won’t rot your teeth. We follow Mike as HE follows the man who took off with the tracker he left as bait in his gas cap. They drive all night, he follows him here, they go there and somehow we’re more intrigued than bored even though we are completely lost on where this is going. But, finally after the sun shows itself and it’s a new day he follows his mark in a Green Jeep to our favorite eatery in New Mexico. As the camera slowly pulls back we see those two smiling chickens standing back to back and the logo Los Pollos Hermanos. Oh the excitement is coming because we all know WHO must be coming back soon! But we just can’t jump in because there’s no buildup–the man has to be interwoven in the story properly. And on that note we get Mike enlisting the help of Jimmy to go into the restaurant later that day to do some reconnaissance. Now I’m sure Mike would’ve rather gone with a more capable person but we know he doesn’t exactly have a lot of friends. So Jimmy goes in there and orders food and tries to blend in when said Jeep Guy comes in with a bag and sits down. Now the comedy in this is watching Jimmy try to be sly and watch him without being noticed. The awkwardness and lack of finesse embody everything we love about this character as he puts so much sugar in his coffee trying to spy on the man that he can’t even stand to drink it. He sits down and continues to watch his “target” as the man patiently waits for something but the best part is in the background– even out of focus– we can see the “Chicken King.” He’s coming up behind Jimmy, just cleans around him, and we never see his face. Finally the man gets up and leaves and as Jimmy in his wannabe sleuthing tries to pick for a clue in the trash he gets caught by (Breaking Bad alert) Mr. Gus Fring (Giancarlo Esposito)! “Can I help you?” he asks. He just stands there as any ordinary man but the history of the character still makes him resonate like a glowing sun. 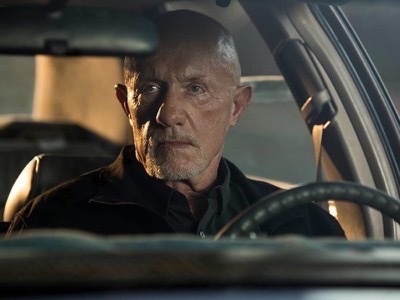 After Jimmy leaves and tells Mike everything he saw we’re reminded of the fun relationship these two characters have as Jimmy tries to convince Mike to let him help more but he isn’t having it. Jimmy is so eager to be a part of whatever he is trying to investigate but Mike is better running solo. We’re left with a last shot of Fring and a sour look on his face as he’s obviously aware of their ploy. 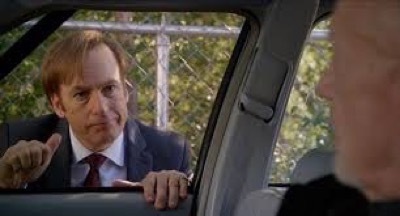 After we take a break from “The Adventures of Mike PLD (Parking Lot Detective)”we go back to Jimmy’s law office where Kim (Rhea Seehorn) and Jimmy have hired a new secretary to help out named Francesca (Tina Parker). 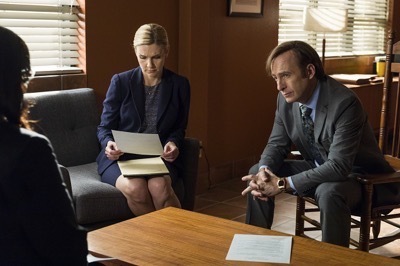 (Second Breaking Bad alert) Francesca will go on to become Saul Goodman’s secretary as well and she is all full of down home fun as Jimmy encourages her to get all folky and charming with the clients to make them feel comfortable. But besides that one cheerful moment the next stage of Chuck’s plan is about to go into effect. Ernesto shows up to talk to Kim and spills the beans about the tape that Chuck has of Jimmy. Kim trying to look out for Jimmy tells him immediately but asks him for money so it can be confidential information between client and attorney. Jimmy seems to take it rather well which doesn’t seem right at all. He even continues to take the tape down off the wall he painted (just like Chuck showed him last episode) as Kim explains their defense plan. But then suddenly he violently rips of the tape and runs out the door. And we know where he’s headed! Over at Chuck’s house Howard has arrived to tell him that the PI (Jackamoe Buzzell) he has them paying (who is staying in the house) for is costing a lot of money. Chuck reassures Howard that Jimmy will be coming over in the night to try to steal back the tape because “I know my brother,” he says. Well as much as Chuck has been right about he’s wrong here as Jimmy shows up furious at Chuck for taping him their conversation. He finds the tape and destroys it right in the room all the while ripping into his brother about how betrayed he feels. But in the end Chuck wins because Howard and the PI are in the other room and witness the whole thing. The mouse trap has been sprung and Jimmy has his hands all over the cheese. While Jimmy is landing himself in the crapper Mike is still staking out Los Pollos and he sees a large black SUV pull up frantically and after a few minutes leaves in a hurry. Before it darts off the window rolls down to throw out a cigarette just so that we can see ( third Breaking Bad alert) it’s an old associate of Fring’s Victor (Jeremiah Bitsui) who fans will recall met his end at the hands of Gus from a box cutter to the throat. Mike notices the tracker has shifted to this new vehicle and follows it all the way out past city limits. When he finally comes to where it stops his gas cap is on the road with a cell phone on it. Gus has shown that he is not fooled by him any longer. The phone rings but we don’t get to see the conversation. Good stuff! 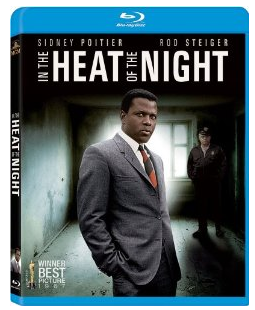 In The Heat Of The Night Blu-Ray Review! Experience The Civil Rights Classic Again In High Definition! 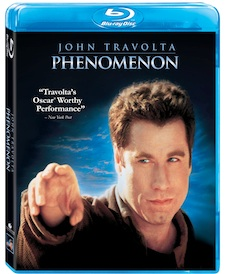 Phenomenon Blu Ray DVD Movie Review! Looking Back At The 1990’s And Remembering When John Travolta Was At The Top Of His Fame… I Mean Game! Doh!